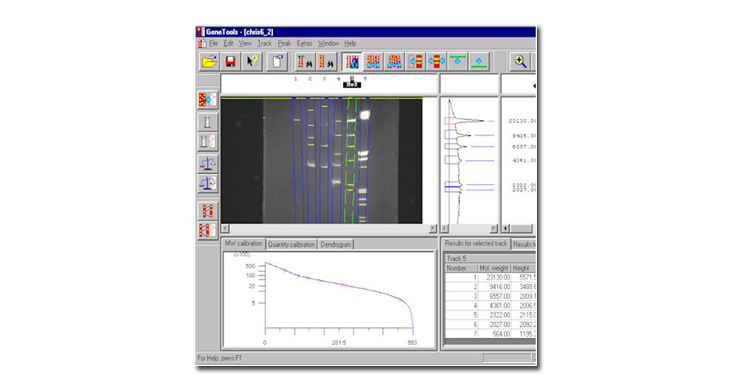 GeneTools analysis software is intuitive, easy to navigate and includes comprehensive tools to provide a full range of analysis capabilities for many different applications including; chemiluminescence, chemifluorescence, fluorescence, colorimetric imaging and colony counting. GeneTools is supplied with every Syngene system and comes with free upgrades for life. Unlimited copies offered with all G:BOX and GeneGnome systems. GeneTools software supports 21 CFR Part 11 compliance. Band analysis/densitometry Ideal for 1D analysis, the software has automatic lane and peak detection. GeneTools software automatically compensates for smiling or distorted bands and tracks. Molecular weight or base pair values can be calculated using standards from one or more tracks. Quantification can also be automatically calculated from standards in a number of ways. Detailed results can be instantly printed or transferred to Word or Excel. Band matching Band matching can be performed by position, defined Rf or calibrated molecular weight/base pair value. Automatic molecular Automatic molecular weight/base pair calculations for sample bands based on standards from one or more lanes. GeneTools has a library of markers for automatic or manual assignment which are user configurable. Multi-tier analysis for high throughput screening Especially useful for analysing high throughput gels such as E-Gel (Invitrogen, UK). GeneTools software provides multi-well line functions with automatic track alignment. Manual band quantification The user can manually quantify bands, spots or other objects on a sample. All data is instantly exportable to Microsoft Excel. Spot blot analysis Automatic detection of spots using a spot grid, quantitative and incidence analysis. The software can also perform multiple background subtraction methods. Colony counting Automatic counting of two colour colonies with the ability to count light and dark colonies on the same plate. Export results to Microsoft Excel and Word Customised results tables can be exported to either Microsoft Word or Excel. Report generation Saves reports with customised protocols designed by the user. All reports are compliant with CRF 21 Part 11.